Growing up, Ruth C. Harris idolized her older sister, and wanted to do everything she did. Although she considered majoring in chemistry when it came time to pick her path, she ultimately decided to follow in her sister’s footsteps and pursue business administration. She found she especially enjoyed accounting, and an inspiring professor encouraged her to see where that interest could take her. Now, Dr. Harris holds a Bachelor of Science in business administration from Virginia State College (now Virginia State University), a Master of Business Administration from New York University and an EdD from the College of William and Mary. She also became the first African-American woman in the Commonwealth of Virginia to become a certified public accountant. As the great-granddaughter of slaves, Dr. Harris found this to be an exemplary achievement, since there were fewer than 100 African-American CPAs across the nation. Upon graduation from New York University, Dr. Harris joined the staff of Virginia Union University as an instructor in the commerce department. Over the next 48 years, she progressed through a variety of roles, including assistant professor, associate professor, and professor of accounting. She also held administrative positions such as department head, director of the Sydney Lewis School of Business Administration, chairman of her department, and member of the management team of the school of business. In 1997, Dr. Harris stepped down from her duties and assumed the title of distinguished professor emeritus, which she maintains to this day. She considers the highlight of her career to be the success of her students. Further, she is proud that, during her tenure, her department was known for making deadlines ahead of time and for being professional and efficient. To keep abreast of community and professional developments, Dr. Harris served on the boards of the Virginia Society of Certified Public Accountants, the Intercollegiate Case Clearing House, the American Assembly of Collegiate Schools of Business and the Community Service and Continuing Education (Title I) Agency. 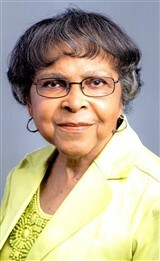 She was also a member of the Richmond Urban League Board of Directors and the United Way Agency Evaluation Committee. She served as a member of the Interdepartmental Committee on Rate Setting for Children’s Facilities, having been appointed by Governor Charles H. Robb. She also participated with Virginia Heroes, Inc.
As a testament to her outstanding achievements in her field, Dr. Harris received numerous accolades. She was named by The Library of Virginia as one of its Women in Virginia History. She was also selected by Dominion Power as one of its Strong Men and Women: Excellence in Leadership honorees. She received the Business Leadership Award from the Virginia Business and Professional Women’s Foundation, the AARP Community Service Award, the Tenneco Excellence in Teaching Award, and the Eboné Image Award and the Serwa Award from the Northern Virginia and Richmond, Virginia, Chapters of the National Coalition of 100 Black Women, respectively. Other notable recognitions included the Outstanding Faculty Award from the Virginia Council for Higher Education, the Teaching Excellence Award from the Sears-Roebuck Foundation, and the Outstanding Virginia Accounting Educator Award, (presented jointly by the Virginia Society of CPAs and the American Institute of CPAs), as well as the Distinguished Career in Accounting Award from the Virginia Society of Certified Public Accountants. Additionally, Dr. Harris was named a Belle Ringer of Richmond by the Richmond, VA Chapter of the National Association of University Women. She was honored to be awarded a Doctor of Humane Letters by Virginia Union University in recognition of her many contributions to that institution. In her retirement, Dr. Harris enjoys reading, playing the piano, and volunteering with AARP. She is an active member of Richmond’s historic Ebenezer Baptist Church, where she has sung in several choirs, been a member of the handbell choir, served as a Sunday School teacher, member of the Board of Christian Education and the Ladies Guild. She has also been an active member of the Alpha Kappa Alpha Sorority, Inc. for more than fifty years.